A lightning rod consists of a catching device, a discharge system and a grounding. This distributes the energy in the ground. In a thunderstorm, lightning balances the difference in voltage between clouds and the ground. Often they strike directly into the soil. Part of the electric power is distributed above ground, most of it goes deep into the ground through the lightning channel. A flash has an average current of 20,000 amperes, some flashes can reach 300,000 amps. Sometimes the lightning strikes a tree or a house. The strong electric current races into the earth after impact in a fraction of a second through this body. This causes fires and house walls can burst. A lightning protection system on the house has a catcher on the roof at the places that are often hit by lightning. The electricity flows to the ground in a controlled manner via the discharge system. The immense forces do not go into the ground through the pipes of the house. The construction of a lightning conductor belongs to a specialist for a good reason. Only he can judge where and how to design the capture device and the derivative. Particularly treacherous is the transition from the arrester to the ground. The lightning current must flow deep into the ground, otherwise it could take the path through the building. Without contact with the ground, the current seeks a path along the wall of the building, through water or power lines. The catching device and the arrester could prevent the lightning without earthing at most from the upper part of the house, the rest would be at the mercy of lightning. 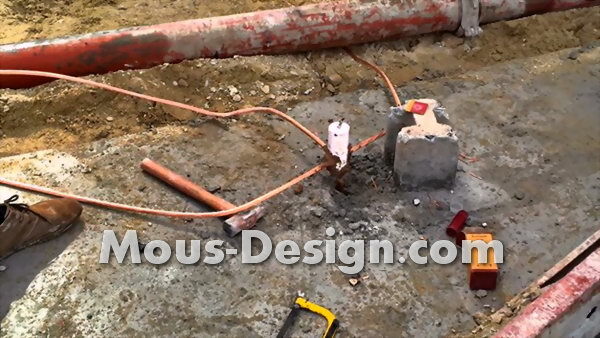 In modern houses there is usually a foundation ground through which fault currents of the electrical system of the house flow into the ground , If this is available, it is sufficient to connect the arrester to it. If this grounding is missing, another grounding system is required. A ring line in the ground, which the specialist enterprise digs in around the house, or a deep grounding, which leads the current into the earth over a three meter long pole, is usual. The purpose of grounding is to guide the lightning current safely into the earth to prevent uncontrolled transition to the house in the final meters. Without a suitable earth, the lightning conductor is ineffective. Installing a lightning rod: what does it cost?